There is nothing quite like a warm soak in the bath after a long day to wash away my worries and ease my mind. Previously I’ve featured detoxification recipes for the bath, like this one, and some great bath salt recipes. But how about something with a little more pizzazz? One thing I can’t get enough of is bath bombs. They are obviously too expensive to be an everyday thing, but I treat myself to one as often as I can. I just love all those bright swirling colors and bubbly effervescence! So I got to wondering whether there was a way to make them myself. As it turns out, it can be done! 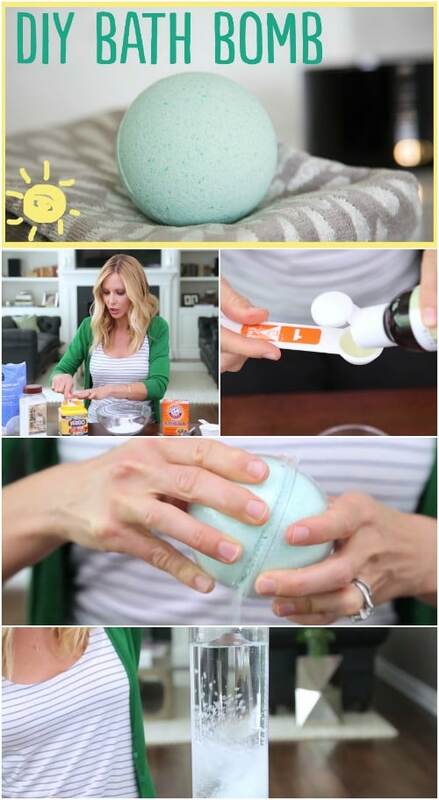 Video and Instructions by WhatsUpMoms. You just combine the ingredients inside the plastic mold and everything is ready to go—it really is amazingly easy. And a lot of these ingredients are things you may already have around the house. All I had to actually go out and purchase was the citric acid, the essential oils and the plastic mold; the rest was just standard household supplies. I’ve made and tested out several of these, and each has been better than the last! I love that you can easily customize this recipe with different colors and scents. These would make fabulous gifts, so I am definitely going to keep that in mind when the holidays roll around this year. In the meantime, I’m going to be giving myself the gift of bath bombs a lot more often! Loving the idea but would’ve loved if proportions were included.